"Since Dr. Melissa treated my gums, I've noticed an improvement in my overall health." Our goal with non-surgical periodontal (gum) treatment at Family and Cosmetic Dentistry of Kokomo is to provide you with an alternative to conventional gum therapy. 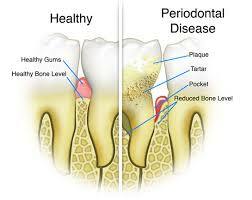 When a patient presents with periodontal disease we have many ways to get your teeth healthy again. We start with a thorough exam followed by home care instructions. Home care is the single most important step in treating periodontal disease. The secret to preventing tooth loss is to brush in the morning when you awake and in the evening before bed. Also, flossing every night before bed is critical. We generally begin treatment with a very detailed type of cleaning called Scaling and Root Planing. This procedure is usually accomplished with either a super strong topical anesthetic gel or traditional numbing. We have a product called Cetacaine which replaces traditional numbing. Most patients find it very comfortable. Commonly, we place antibiotics directly in the infected areas and may even use a laser to decontaminate the periodontal pocket. This therapy takes a few visits to complete. We also have medications such as prescription mouthwashes, toothpastes, and oral antibiotics which increase the effectiveness of our therapy. We have many devices available to accomplish excellent oral hygiene at home such as the Sonicare Tooth Brush, the Water-Flosser or Water Pik, the Braun Oral-B Brush, and Butler tongue scrapers. We always encourage patients to have regular dental check-ups 3-4 times per year and live a healthy life style to maintain a state of excellent oral health. That is one reason why regular dental checkups and periodontal examinations are very important. Treatment methods depend upon the type of disease and how far the condition has progressed. Good oral hygiene at home is essential to help keep periodontal disease from becoming more serious or recurring. You don’t have to lose teeth to periodontal disease. Brush, clean between your teeth, eat a balanced diet, and schedule regular dental visits for a lifetime of healthy smiles. Unremoved, plaque hardens into calculus (tartar). As plaque and calculus continue to build up, the gums begin to recede pull away) from the teeth, and pockets form between the teeth and gums. The gums recede farther, destroying more bone and the periodontal ligament. Teeth - even healthy teeth - may become loose and need to be extracted. Brush your teeth well twice a day. This removes the film of bacteria from the teeth. Be sure to use a soft-bristled toothbrush that is in good condition. Toothpastes and mouth rinses containing fluoride strengthen the teeth and help prevent decay. Choose products that bear the American Dental Association Seal of Acceptance, your assurance that they have met the ADA’s standards for safety and effectiveness. The ADA reviews all advertising claims for any product bearing the Seal. The Seal on a product is an assurance for consumers and dentists against misleading or untrue statements concerning a product’s safety and effectiveness. Clean between your teeth every day. Cleaning between your teeth with floss or inter-dental cleaners removes bacteria and food particles from between the teeth, where a toothbrush can’t reach. Early periodontal (gum) disease can often be reversed by daily brushing and flossing. If you use inter-dental cleaners, ask Dr. Melissa how to use them properly, to avoid injuring your gums. Eat a balanced diet. Choose a variety of foods from the basic food groups, such as breads, cereals and other grain products; fruits; vegetables; meat, poultry and fish; and dairy products, such as milk, cheese and yogurt. Limit between-meal snacks. Visit us regularly. It is important to have regular dental check-ups, and professional cleaning is essential to prevent periodontal disease.